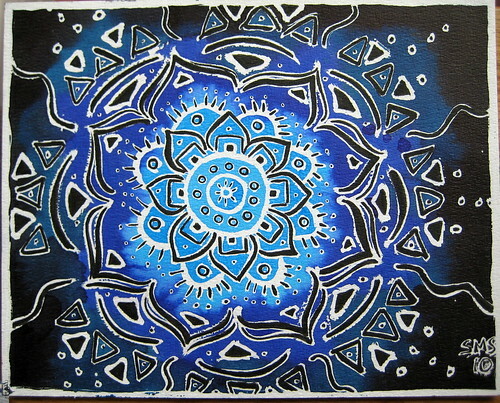 What a beautiful mandala! The use of the frisket is a great idea - thanks for sharing it. This is incrediblly beautiful and inspiring. True intention will transform the world and it is the simple things like this that will move through the veil and connect. this really is lovely, and such a beautiful way to express your love and concern for your friend. When I saw this one the first thing that came up in my mind was "reconciliation" , letting go, peace...very, very powerful image! I am sorry for your friend's loss! Megan - thank you. I've tried a few different ways to mimic the appearance of batik and this so far has been my favorite. Anon - Thanks to you! You have a very nice blog and your mandalas are beautiful. I have been researching chakras and mandalas. I make pottery and am making heart shaped bowls. My sister-in-law wants one in the heart chakra colors. How simple and a great idea. This is your most spiritual piece to date,(as seen on this blog). It shows soul and love. Stunning work, words cannot really begin to describe it. Thank you for sharing that really special creation.